Photo editing is my part time hobby and also important for blogging purpose. There a lot of web-based apps available for photo editing such as: Picnik image editor (Google merged it with Google+ & standalone editor was shut down), PicMonkey, Ipiccy, Fotoflexer and many others. But in these online photo editing tool s some of the image effects and photo touching tools are only available to premium customers. Today I found another web-based online image editor for retouching photographs. 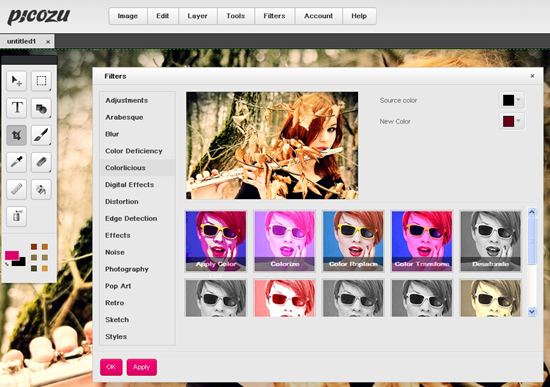 Picozu Image Editor is based on HTML5 and CSS3 requires no Flash or other plugins. You can edit and create new pictures from scratch. In Picozu there are dozens of filters and image-effects to give your photos a genuine look. Upload images from your desktop or you can simply import photos from your cloud-based profiles like Flicker, Color Palette, SkyDrive, Google Drive, Facebook or Dropbox. Their Firefox add-on allows you to take a screenshot of a given browser page and save it to Picozu Image Editor. You an explore various editing tools such as color fill, magic eraser, freehand selection, cropping, selections and more. Also get chrome extension here. Pixlr is also a great tool for online image editing. I never used Picozu. Now I am going to use Picozu also.